Somebody pinch me. Did this really happen? I just returned from visiting Colorado’s San Juan Mountains and photographing not one, but two, Canada lynx in the wild. The Canada lynx is a Colorado state endangered species. For the protection of these animals, details regarding whereabouts have been omitted. You may wonder, how does one go about photographing a Canada lynx in the wild? When I set out on this project three years ago, I had no clue. “It’s nearly impossible”, people insisted. Even researchers dedicated to studying lynx rarely, if ever, encountered one outside of a trap. Search the web and you can count the number of wild lynx photos from Colorado on one hand. One of the most recent photos, taken in 2013 by retired Colorado Parks and Wildlife employee Steve Chaney, went viral and was picked up by the Huffington Post. The Canada lynx was reintroduced to Colorado beginning in 1999 after being wiped out by predator poisoning, over hunting, and loss of habitat. 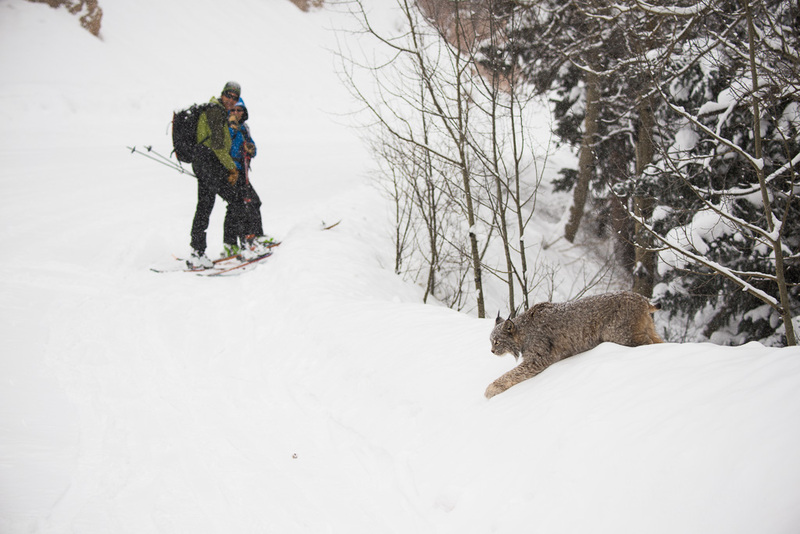 Prior to the reintroduction, the last verified sighting of a lynx was in 1973 near Vail. 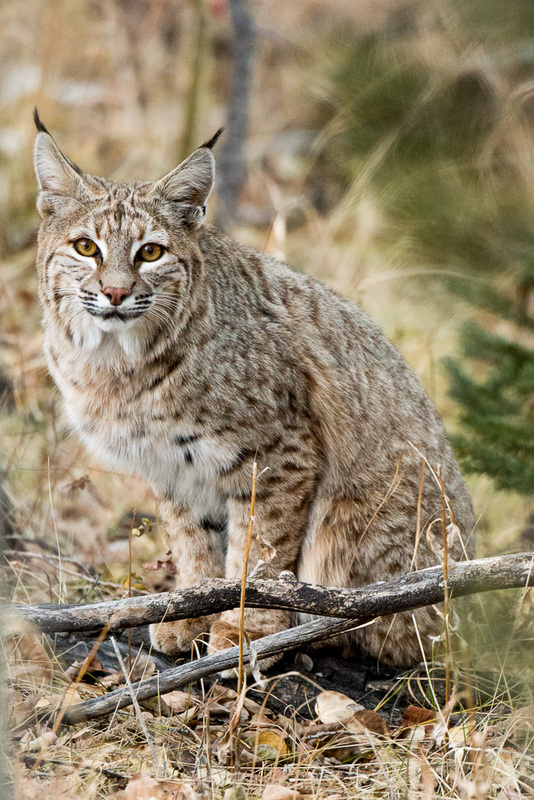 Between 1999 and 2006, just over 200 lynx were released into the Colorado high country. Since then, the reintroduction has been declared a success and researchers are working to monitor the size and potential expansion of the lynx population in Colorado. The bobcat (above) and Canada lynx are often confused. “Oh, I saw a lynx once”, people often tell me. “Lynx, or bobcat?” I reply. Nine times out of ten, after paging through fuzzy iPhone photos, we will determine that their lynx was, in fact, a bobcat. Bobcats are constantly misidentified as lynx. Although secretive, bobcats are common on the Front Range, and if you spend enough time here, you have decent odds of seeing one. Lynx are rare, elusive, and typically live in remote stands of high altitude forest. Lynx and bobcat can be difficult to tell apart because they are closely related. 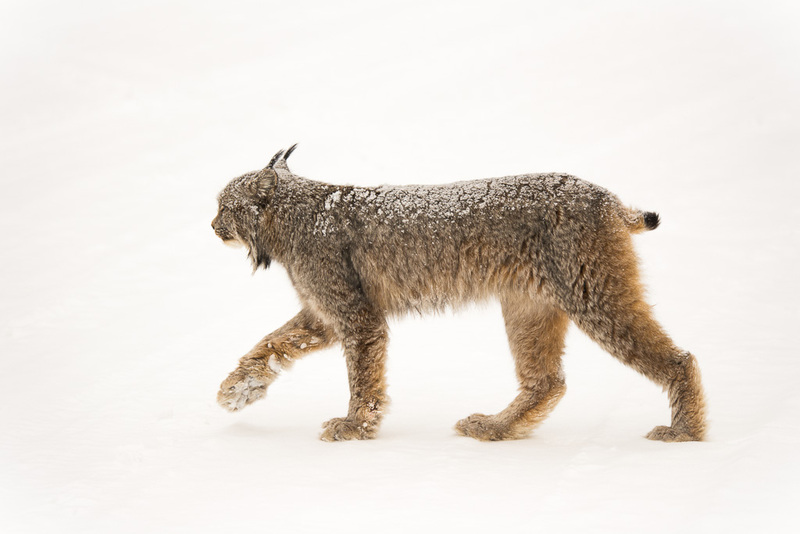 Last year, a photo of a bobcat made the rounds in the media under the headline “Rare Mountain Lynx Spotted, Photographed near Wild Basin Lodge in Estes Park Area.” Everything about a lynx is larger than a bobcat, but especially its massive feet. 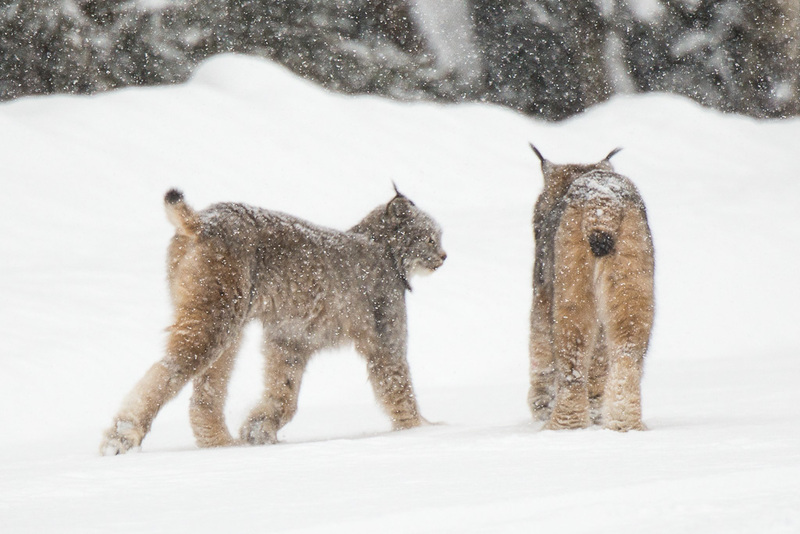 If you are unsure, a foolproof way to tell a lynx from a bobcat is to get a good look at its tail. The black tip on a bobcat’s tail only goes halfway around; the underside is white. A lynx’s tail is black all around, like it’s been dipped in paint. But back to the question at hand – how does one go about photographing a Canada lynx in the wild? I’m still not sure I can answer, but my story begins on a wintry morning in the San Juan Mountains. We woke up to heavy snowfall and the kind of avalanche danger that sends normal people fleeing to the patrolled boundaries of the ski resorts. I was glad to be with experienced friends who know the local terrain. On our way to the trailhead, we decided to make a detour to check a nearby site for lynx activity. “Nearby” in the San Juans is a relative term. As the crow flies, it was just a few miles, but it would mean an extra hour and a half in the car. As the snow continued to fall, the risk of an avalanche burying the road and leaving us stuck loomed in our minds. It’s funny how the subconscious works. During the drive, my friends told me about their encounter with a pine marten last summer. In the predawn twilight, their brains had picked up on the shape of the marten as it clung motionless to the trunk of a tree, even before they knew exactly what they were looking at. Buried deep inside, we still possess those abilities that meant the difference between a meal and starvation to our ancestors ages ago. Fresh Canada lynx tracks in the San Juan Mountains. “Stop!” I called out as a set of tracks whizzed by the passenger window. A buzzer was going off in my subconscious cave man brain. We had seen hundreds of tracks crisscrossing the fresh snow all morning, but there was something subtly different about these. 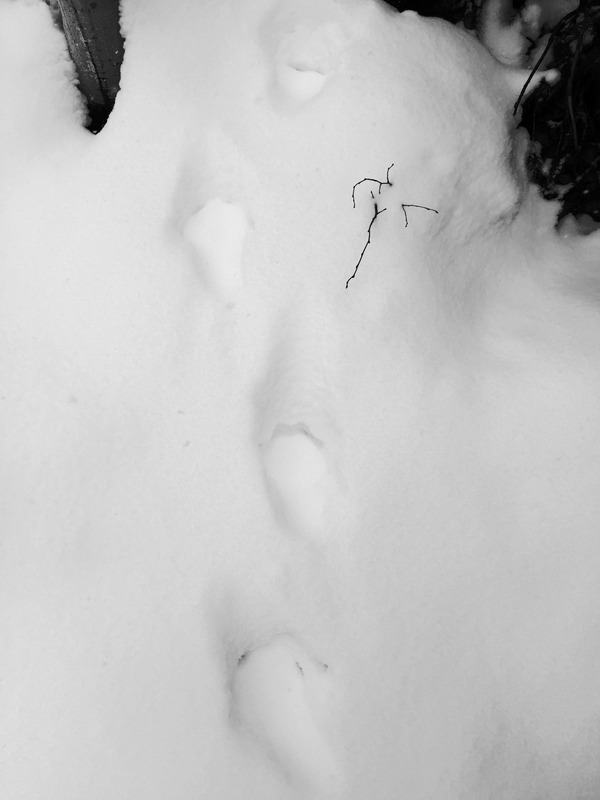 Jumping out to investigate without bothering to lace up my boots, I struggled to identify the tracks as they filled in with snow beneath my nose. I knew they were something I had never seen before – a short list of possibilities. I couldn’t follow the tracks. The hillside was too steep, the snow too deep, and the brush too thick. My feet were getting soaked and my friends were ready to move on before the roads worsened. I crawled back into the truck and we drove off, exhilarated and a more than a little befuddled. The story just as easily could have ended here. But it didn’t. Just up the road was a trail heading into the woods, and with some luck, the trail might intersect the tracks. Perhaps, sheltered beneath a canopy of pine boughs, I might be able make out more details in the tracks. We put on our skis and started up the trail. About a hundred yards in, a snowshoe hare played hide and seek with us in the undergrowth. As we stopped to watch it, I saw the mysterious tracks crossing the path just ahead. This time, I was able to follow them, and under a spruce tree, I could see the prints clearly in the snow. Cat tracks. My friends remained to watch the snowshoe hare as I followed the tracks down the hillside. They were fresh and looping right back towards our truck. The animal must have been sneaking down as we were headed up. We had missed it by a matter of minutes. This could have been the end of the story. But it wasn’t. Today was a lucky day. As I lingered, trying to piece together what had happened, not one, but two Canada lynx appeared out of the forest and casually traversed the road. With my camera handy, I snapped off a few dozen shots before they disappeared into cover again. I had just had my first look at a Canada lynx in the wild! Double lynx all the way! I felt a little guilt. My friends were still up the trail. When they caught up, they were trying to tell me something about the snowshoe hare. “C’mon!” I prompted and we huffed and puffed in the thin air back to the location where the tracks disappeared into the woods. I told them about the lynx and showed them the photos on the back of my camera. Once again, the story could have ended here. But once again, it did not. Today was a very lucky day. We decided to stick around a bit longer. We knew what direction the lynx were headed, and there were some nice clearings that might offer another chance to see them. As it often does, the persistence paid off. After perhaps fifteen minutes, my friends got their first glimpses of the lynx between the trees. We could hear them calling to each other in short growls. It was something I had only heard in zoos until now. Then, the grand finale. The first lynx emerged from the woods halfway between me and my friends. We stood dead still and held our breaths as it crept to the shoulder of the road. It cautiously looked both ways and stepped out. The second lynx followed behind and together they crossed before disappearing once again. Two ghosts of the boreal forest had just granted us a front row seat. A front row seat for a Canada lynx crossing. Honestly, this is never how I thought the story would go. In my mind’s eye, I pictured cold, lonesome days in a blind. Winters of couch surfing in the San Juans, missing my wife and questioning my sanity. Just waiting for a chance at a grainy, distant photo of a lynx through the pine trunks. Maybe it was a very lucky day. Maybe it was providence. Or maybe I’m still dreaming. Wow. I am extremely envious. In Alaska (at least) there is a well known cyclical population boom and bust with Lynx population changes shadowing those of the Snowshoe Hare with a cycle of around 10 years. Is there something similar in Colorado perhaps and is this year a boom year? My understanding is that the hare populations in Colorado follow similar cycles. I haven’t seen any numbers on where the population is currently headed, but in the areas I visit, it feels like it is trending upward. Also of interest, research after the reintroduction showed that lynx in Colorado lean on pine squirrels as a secondary food source when snowshoe hares are not abundant. Thanks that’s interesting. I am going to have to visit Colorado soon I think! nothing so great. Golfers see links all the time! Thanks for sharing this wonderful story. Reading your story just made my day. Thank you for sharing!! Awesome, Jim–congrats! Great find and a great story! Thanks, Steve! Hope you are doing great! I’d love to have that kind of encounter! I love wild-cats! Congratulations, James. Your success is the gift of Nature that occurs when you connect with our wild brothers and sisters. My wife and I had a terrific close-up encounter with a Canadian lynx (yes, we got a good look at the tail!) but that was in Canada and there was no question of reaching for the camera. What struck us most was the absolute silence with which s/he was able to move across a forest floor that scrunched at the slightest movement of our feet. Great pictures, James. Thank you. Are lynx usually that slender? Not sure, but I think they do look a bit lankier than bobcats. Fantastic pictures. Grandpa would be very proud of you! Thanks! Really enjoyed the sequence of the gray fox and opossum on your blog! The Canadian Lynx in Washington State is severely endangered. Only 50 remain. Main problems are the Canada Lynx were being killed for their soft fur which brought them close to extinction and climate change. There are only 50 Canadian Lynx in WA State, and we are the main reason, it’s up to YOU to save them to. Ways you can help is by donating to a fundraiser, spreading this message or finding out more and taking action. We control this all, YOU choose whether to take action or not. Find your district then contact your representative to tell them that the Canada Lynx needs special protection in Washington, send the message above to them. If enough people seen this,congratulations, you have made a change! Wow, Congratulations on a spectacular find and photos. Jealous isn’t even enough. Hey James. As Stymie once said. Isthmus be my lucky day. Great shots. A story and a couple of questions. In your article you mentioned high altitude. Can you please put a number on that? I live right at 7,000 feet. We moved to our present location west of Trinidad , Co. several years ago. We are very isolated. The terrain is mostly scrub pines , pinion , juniper. There are areas close by with tall stands of ponderosa. Water is extremely scarce. 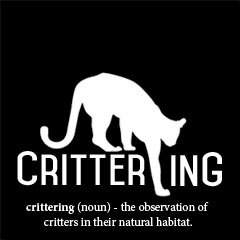 We have lots of critters around us which I very much enjoy having as neighbors. A couple of years ago I kept hearing a cat calling early mornings and at night. Not being familiar with the calls I searched cat calls and both my wife and I picked Lynx as that was the only one that sounded anything like what we heard. The Bobcat recordings sounded nothing like what we heard. I do see Bobcats BTW. In my reading / searching I did come across an article saying Colorado had reintroduced Lynx in the state. I contacted the state wildlife dept. and advised them of what I heard and my recording searches and they said no way. Too dry. There are 12,000 foot peaks ( The Southern Sangre’s ) about 30 miles behind my house. Your thoughts please. Yes , I know I should invest in a critter cam. Lynx are found in the subalpine forest where there is deep snow and snowshoe hares. So about 9000-11000 ft, give or take. We have both Snoeshoes and Jackrabbits in my area. colorado colorado. I truly appreciate and love this state. I am a wildlife biologist and work projects in several of our western states where furbearer lethal trapping is legal. Montana, Wyoming, Utah – the topography is gorgeous. But hiking day after day through these states’ forests and wilderness the quiet is forlorn. Small furbearers are on the decline – leg hold trapped and snared. My most recent survey project in eastern Utah ended a few months ago. I could hike and ride my horse for days in remote areas near Monticello and hardly ever see a small furbearer track or animal. My navigator and best friend Airedale terrier Zeke got caught in a leg trap legally set withing 50 meters of a public fishing reservoir. I almost lost Zeke when he got caught in a lethal snare next to a dirt road just outside the town limits. Zeke is alive only because I carry wirecutters in my pack during trap season. I will never forget the territifed hissing wheezing noise he made as the snare locked around his throat. Now I am back in the mountains above Buford! Since home I have been blessed (corny word, but true) with sharing my travels with bobcat, marten, fox, ermine, ‘yote, black bear, skunk, otter and cougar. And those are just the carnivores I have seen. Many pairs of eyes unobserved by me certainly have been watching as I moved through their territory!